My first big roller coaster was Canyon Blaster at Adventuredome in the Circus Circus Hotel in Las Vegas, NV. In case you don't know, Canyon Blaster goes upside down 4 times, which for me was HUGE back in June 2000 (I was still 8 years old at the time). Since then, I've been hooked to roller coasters. I made it a goal to one day ride a lot of roller coasters and find my "true love" coaster -- that is my favorite roller coasters. This is one of those few coasters in the world that does not stop exciting its riders until the very end, until the one point where the train actually hits the final brakes. 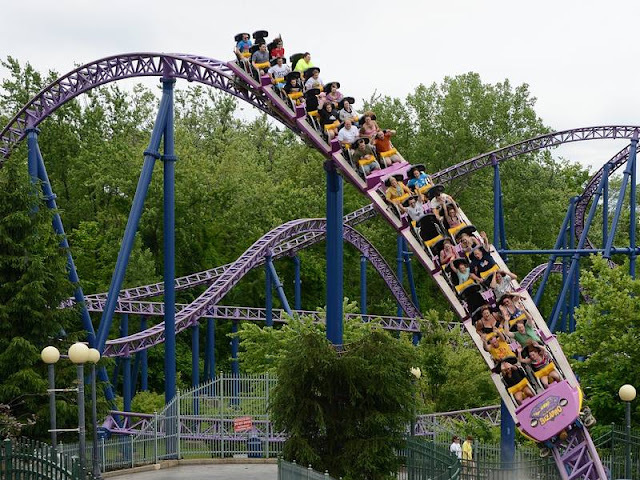 With a main drop of 221 feet and a total length of 5,400 feet, Bizarro is not just a satisfying coaster. It's long, it's fast, and it makes you fly off your seats most of the time. Bizarro also makes great use of the surrounding terrain by adding underground tunnels, which make the coasters even more intense and exciting. TIPS: Ride Bizarro at night, when you are able to see the beautiful view of the moonlight being reflected on the river. As time goes, technology becomes more advanced. This makes it possible for theme parks around the world to build taller, faster, longer, and steeper roller coasters. Heck, if you want to say weirder, you can say that too. Nevertheless, legacy coasters are always, and will always be, sources of nostalgia for some. In 2009, I was one of the very lucky people in the world to ride a roller coaster from 1989 located in Cedar Point, in the small town of Sandusky, OH. But Magnum XL-200 is a classic. It is the first coaster to cross the 200-foot mark in terms of height. It was also one of the fastest roller coasters, perhaps even the fastest at one point! The view you see throughout this coaster is simply breath taking. 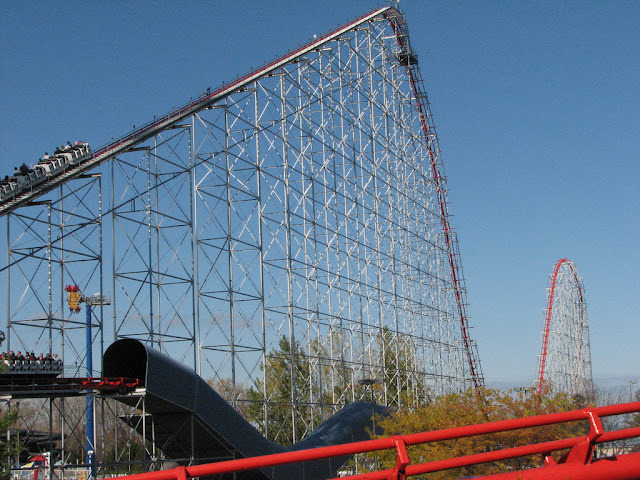 Built at the side of Lake Erie, there was no denying that you will breathe a lot of fresh air while riding this coaster... unless you are suffocating due to terror. Magnum XL-200 provides a great amount of airtime and that signature "shaky" and "rough" feeling of an old coaster. It's simply an enjoyable coaster that one would want to ride again and again... and again. When Bolliger & Mabillard, or B&M, announced that they would build a 300+ feet coaster for the first time, coaster enthusiasts around the world voice their joys! "Finally!" they said. B&M is well-known for their coasters' reliabilities, smoothness, and re-ride-ability (meaning you are physically and mentally capable of riding the coasters multiple times). B&M's first 300+ feet coaster was Leviathan, located in Canada's Wonderland near Toronto, ON. Meet Fury 325. It has a main drop of 325 feet, a top speed of 95 mph, and a total length of 6,602 feet. Sounds like a lot to handle? It sure is. 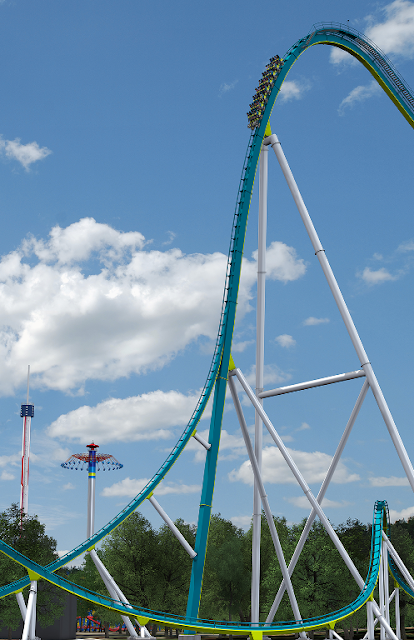 Fury 325, in my opinion, has THE WORLD'S BEST FIRST DROP. Built at an angle-of-descent of 81 degrees, riders will experience weightlessness for approximately 1.5 seconds before being pushed into the Earth at a G-Force close to 5.0. From there, Fury 325 takes the riders through sharp turns, airtime hills, and the signature below-the-bridge dip, which always make the riders go ducking into safety. Fury 325 is an unbelievable force to reckon in the world of steel roller coasters. It's fast, it's tall, and it's long. TIPS: Want the wildest ride possible? Sit on the 4th or 5th row, the outer left seat. You'll know what I'm talking about when you finished the ride! Steel roller coasters have become more and more dominant in the theme park industry over the years. While this is true, some theme park goers still miss that nostalgic feeling when riding wooden roller coasters. That rough feeling that sends the riders hurtling up and down, and left and right, is what makes wooden coasters so special. El Toro opened in 2006 to wildly positive words of mouth amongst theme park goers around the world, particularly in the East Coast area. Why? 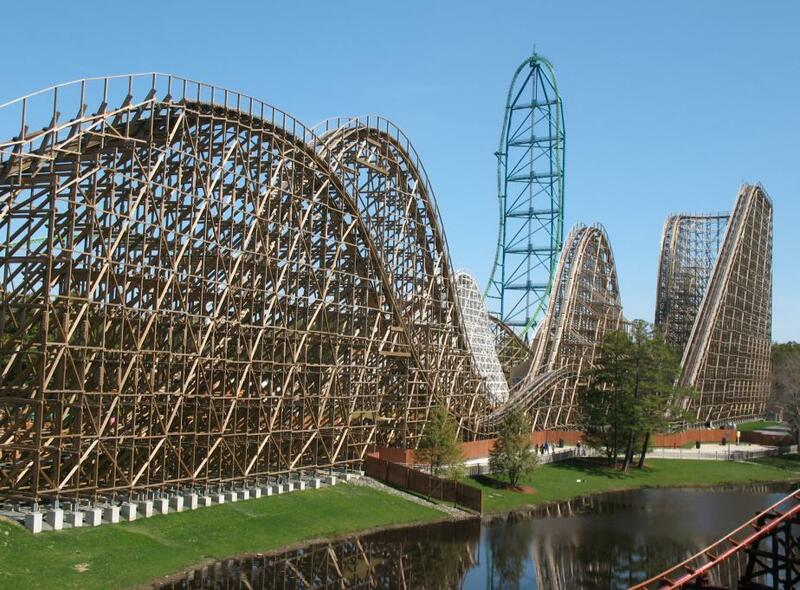 Here came a wooden roller coaster that came out of nowhere and surprised every single expectation by offering some of the WORLD'S MOST EXTREME AIRTIME MOMENTS to be experienced on any roller coasters on the planet. Throughout the course, riders are sent out of their seats. The airtime in this coaster is just simply crazy. Add with the fact that the trains only use lap bars, El Toro is one of the most intense roller coasters in the world. I still remember people saying this when they left the ride, "I've never been out of my seats on roller coasters like that in my life!" El Toro is currently the world's 2nd fastest, 2nd tallest, and 4th steepest wooden roller coaster in the world. I think that say a lot about this coaster. In this world, there are a lot of types of roller coasters. There are the intense ones that I would rather ride only once. There are the ones that are just simply enjoyable, but not really good. There are also ones that are just, well... underwhelming. To me, Intimidator 305 is a roller coaster that surpasses all of my wildest expectations. This is the one roller coaster that will shake your inner self and hold your guts tight into your heart, only to have them being thrown out of your body as soon as the train goes down. Intimidator 305 is an extreme roller coaster. In fact, this is one of the very few roller coasters in the world that has given me a black out. Like literally black out, as in, you see nothing with your eyes but black. Just black. Because of the extreme G-force. Unlike other roller coasters that like to go up and down the airtime hills, Intimidator 305 approaches the idea of roller coasters differently. It lays low to the ground, sending riders through wild, extreme turns that generate extreme forces. In fact, it is so extreme that the manufacturer, Intamin, decides to use over-the-head restraints instead of the usual lap bars that are commonly associated with this kind of coaster. 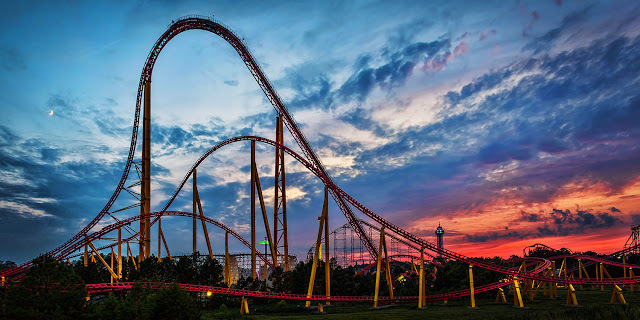 With a first drop of 305 feet, top speed of 93 mph, and length of just over 5,100 feet, Intimidator 305 is surprisingly re-rideable... if the line is not that long. I think that's all from me for now, guys! Next time, I will talk about... how about SCARIEST ROLLER COASTERS?